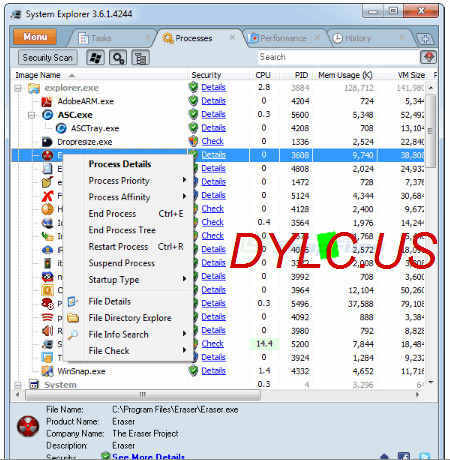 "analyze running processes and system changes"
System Explorer is an enhanced Task Manager that provides detailed information about running processes, startup programs, IE add-ons (BHOs), autorun applications, system drivers, Windows services, network connections, system performance and more. It also keeps track of a history of processes that were started, and allows you to create file and registry snapshots that can be compared to analyze system changes in detail. System Explorer integrates online look-ups into the right click menu for any process, driver or service, allowing you to retrieve additional information (and virus checking) from online sources including Google.